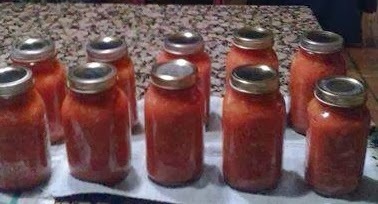 Renee's Stewed Tomatoes - Canning Homemade! Many have been looking for a stewed tomato recipe that can be water bathed. Renee put together the recipe from the Amish Canning Cookbook that came out this last summer and it's super easy to make. From Renee: I omitted the green onion because I forgot to buy it, so I used a garlic press and put in about 3 cloves in. I also cooked it all in my roaster pan. I used the great instructions on SB Canning site to peel my tomatoes. My husband had made this recipe this last summer and my stepdad loved it when my mom made tomato soup for him, so I made it again. Water bath for me was 55 minutes for 1000-3000 ft. for quarts and for pints 45 min. Preparation: Prepare 7-8 pint jars or 4 quarts, lids, and rings. Sterilize the jars and keep them in the hot water till its time for processing. Make sure to fill your water bath canner and get the water to a simmer. Cooking: Combine tomatoes, celery, onion, and green pepper in a large pot and simmer 10 minutes. ( Do not add more celery,onion, and green pepper than called for in this recipe it will make the pH less acidic and not safe for the water bath canning process). Filling the jars: On a dishtowel place your hot jars and using your funnel, ladle to fill to 1/2" headspace. When packing stewed tomatoes into hot jars , add 1 tsp salt and 2 T lemon juice to each quart jar, 1/2 salt and 1 T lemon juice for each pint jar. Pack tomatoes into jars, leaving 1/2 in headspace. Remove air bubbles and refill to the proper headspace with the mixture if necessary. Taking a clean papertowel wet it with warm water and wipe the rims of the jars removing any food particles that would interfere with a good seal. Using your magic wand extract the lids from the hot water and place them on the now cleaned rims. Add your rings to the tops of each of the jars and turn to seal just "finger tight". Processing: Make sure your rack is on the bottom of the canner and place the jars in the water bath making sure that the water covers each of the jars by 1 to 2 inches. Add hot water to the canner if it doesn't measure up. Cover the pot and turn up the heat under the canner and wait for the water to start boiling. Once the water has come to a boil start your timer for 50 minutes for quarts and 40 minutes for pints. (0-1000ft) When complete turn off the heat and remove the cover and let the jars sit for another few minutes. Remove the jars and place them back on the dishtowel in a place that they will sit overnight to cool. Do not touch or move them till the next morning.